The Targhee sheep is a breed of domestic sheep from United States. It was developed in the early twentieth century by the USDA’s Agricultural Research Service. It was named after the Targhee National Forest. The Targhee National Forest surrounds the U.S. Sheep Experiment Station in Idaho. Targhee sheep are a dual-purpose breed, with heavy, medium quality wool and good meat production characteristics. These animals are very hardy and they are especially suited to the ranges of the West where they were developed. Currently the Targhee sheep is especially popular in South Dakota, Wyoming and Montana where their ¾ fine wool and ¼ long wool breeding is favored by western ranchers and are also known as a "comeback" sheep. Very soft fiber around 20-21 micron count.
. Ancestors of these animals were Corriedale, Lincoln and Rambouillet sheep. The flock book for the Targhee sheep breed was closed in 1966, meaning that only the offspring of registered Targhees could be registered. Adding in texel genes to our breeding program. This will improve our meat available to you! Originating from the Netherlands, from the island of Texel, early in the nineteenth century, Texel sheep have proved time and time again to be at the top if not the winner in many carcass contests throughout the world. 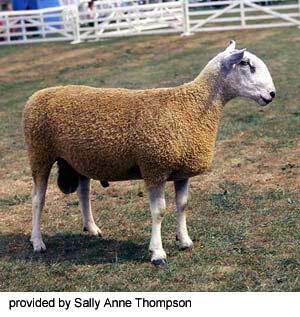 A heavily muscled sheep, it produces a lean meat carcass and will pass on this quality to crossbred progeny. Known for the superior meat quality and naturally lean fat content, Texel sheep are a superb choice for quality lamb on the dinner table. It is presently a popular lean meat sheep across Europe, as well as Australia, New Zealand and the United States. Texel rams have become the number one choice for the terminal sires in Europe, and we are striving for that same goal in the United States of America. The wool is around 32 micrometres and is mostly used for hosiery yarns and knitting wools. With wonderful dispositions, docile, gentle temperaments, they are a number one choice for many sheep breeders. Make your next breeding ram or ewe a Texel! Bluefaced Leicester... New for 2017! We are excited about our new additions of rams and ewes. Wonderful handspinning qualities of their wool! Hoping to have lambs available for purchase in 2018. Wool will be available summer of 2017. The Bluefaced Leicester is of the English Longwool type and originated near Hexham in the county of Northumberland, England, during the early 1900's. The breed was originally developed to use in the production of high quality crossbred ewes which were pastured in the neighboring hills of the region. They originated from Border Leicester individuals selected for the blue face (white hairs on black skin) and finer fleeces. They are found primarily in Northern England, Scotland and Wales. The average weight for mature rams is approximately 250 lbs (115 kg) with adult ewes weighing 175 lbs (80 kg). The prolificacy of the breed is good with the lambing percentage from mature ewes being reported to range from 220 to 250 percent. The wool is classed as demi-luster and fine. The average fleece weight is 2 to 4.5 pounds (1-2 kg), staple length is 8 to 15 cm and quality is 56's to 60's. These wool qualities appear to be passed on to the crossbred offspring. LOOKING FOR 4-H SHEEP? CHECK US FOR AVAILABILITY. RAW WOOL, ROVING, & YARN FROM OUR SHEEP SOLD THROUGH OUR ON-FARM STORE, BROWN'S COUNTRY STORE. HAPPY TO SHIP TO YOU, CONTACT US FOR MORE INFO.